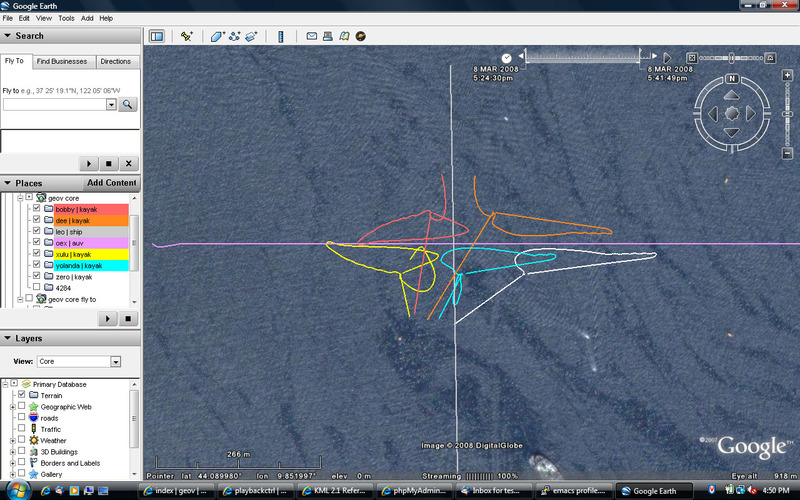 google earth interface for ocean vehicles (geov). 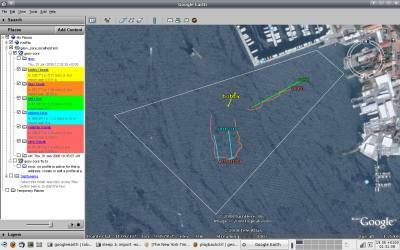 geov (pronounced "jove") is an extensible viewer based on google earth and php/mysql that allows both realtime and historical viewing of ocean vehicles. 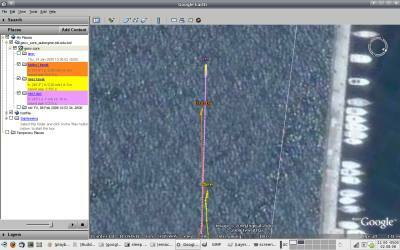 it is presently primarily a research tool for autonomous underwater vehicles and surface craft. ensure the vehicle data is being imported into geov's database. for MOOS, this means running iMOOS2SQL ( example .moos block ). create a profile with the vehicles you want to see. be sure to bind the ip of the machine you wish to run google earth on. 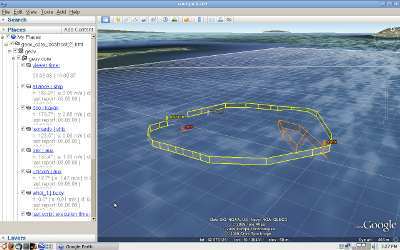 download the geov kml file to your computer. 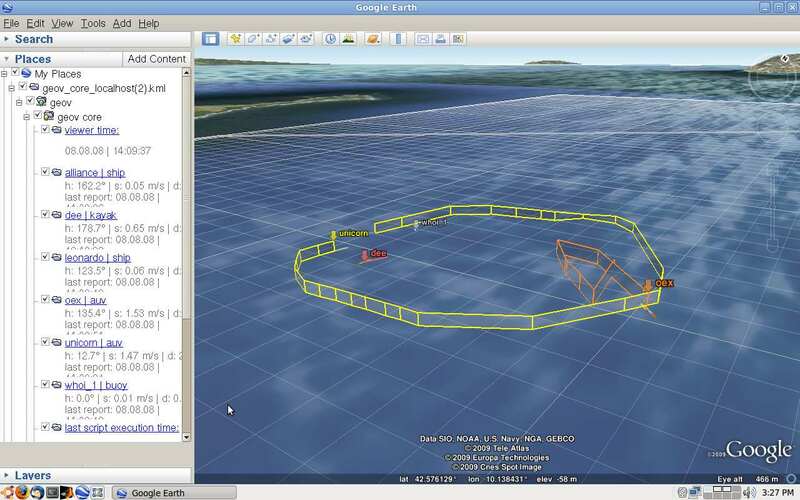 run google earth and open the file you just downloaded (file | open). 2.9.09: google earth version 5.0 released with support for bathymetry. geov has been updated to include depth display (see screenshot below). numerous bugs fixed and new features added: release notes . 10.20.08: data from glint (alliance server only) merged. 6.27.08: two new modules added in the last week: moos_nafcon_target shows vectors for target tracking using ONR PLUS messages. moos_opgrid overlays an operation region and (optionally) an xy grid. 6.23.08: server moved (physically) causing DNS change from aubergine.mit.edu -> aubergine.whoi.edu. 5.21.08: pAIS2SQL deprecated. use iMOOS2SQL which has more features and is backwards compatible. 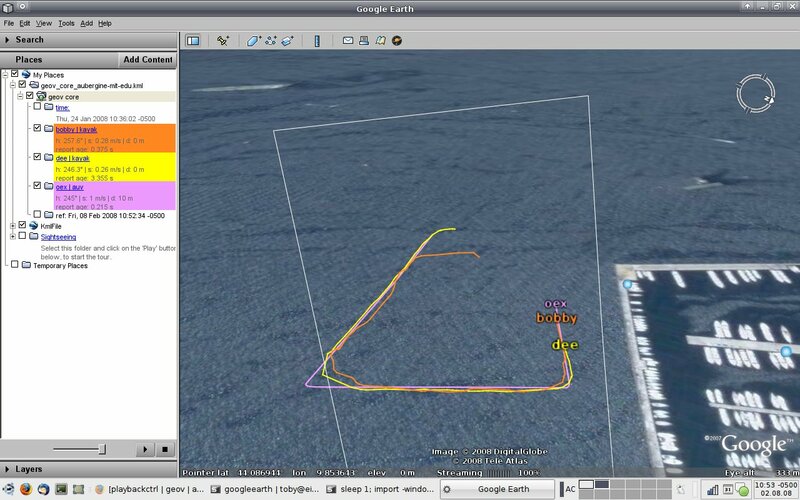 4.21.08: google earth version 4.3 released and geov has been updated to work with it. this new version of ge has several new features and bug fixes so go download it.